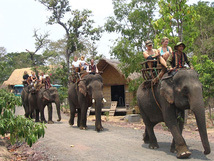 Every year, when Tet comes, people in the central highlands province of Dak Lak and visitors have the chance to cheer on their favourite elephants in races. Once pristine, the mountains around Lak Lake in the central highlands are scarred by bare tracts of land that auger poorly for the area’s future. Lak Lake in Lak district, Dak Lak province, is located on the route through the central highlands from Buon Ma Thuot to Dalat. The Buon Ma Thuot Coffee Festival and Central Highlands Gong Culture Festival 2017 will be organised to promote the brand name of Buon Ma Thuot Coffee, the largest coffee centre in Vietnam, as well as to present the diversity of ethnic minority culture in the central highlands, especially the gong culture, which has been recognised as an Intangible Cultural Heritage of Humanity since 2005. The festival will feature many activities, such as an opening ceremony on 10 March in Buon Ma Thuot City, a coffee exhibition, and a conference on tourism promotion and investment in the central highlands on 11 March, with the Gong Culture Festival, the Elephant Festival, and the Dug-out Canoe Festival to be held at 9am on 12 March at Lak Lake in Lak district, Dak Lak province. Visitors will also have the chance to drink free coffee along many streets in Buon Ma Thuot city. The An Thuong quarter in Danang’s Ngu Hanh Son district is to be turned into the first tourism area catering to late night shopping and entertainment in the central city. The project will cover four main streets - Vo Nguyen Giap, Hoang Ke Viem, Chau Thi Vinh Te and Ngo Thi Si. Five streets will be pedestrian malls - An Thuong 1, An Thuong 2, An Thuong 3, An Thuong 4, and Tran Bach Dang. The An Thuong quarter has a busy tourism scene, welcoming around 1,400 tourists each day during the high season (April to September) and 650 visitors during the low season. Nearly 300,000 tourists, 74,000 of whom were foreigners, stayed in the quarter in 2017. Danang welcomed 6.6 million tourists last year, including 2.3 million foreigners. The city has long been short of international-standard late-night entertainment for tourists. Community-based tourism projects will be developed in the central highlands province of Dak Lak, including Yang Lanh village in Buon Don district, Ya village in Krong Bong district, and Tring village in Buon Ho town, with a focus on traditional culture, ethnic rituals, and cuisine. They offer visitors the chance to dine and join in activities with local people. Priority will be given to the Yok Don national tourism area and an agricultural and community-based tourism project in Cu Sue commune, Cu M’gar district, along with resorts, entertainment and sport areas in Buon Ma Thuot city and the districts of Buon Don, Lak, and Cu M’gar. The province welcomed 703,000 holidaymakers last year, up 13.2% against 2016, including 67,000 foreign tourists.